In Iran, the concept of freedom does not exist. The regime has imposed its standards of behavior, preventing the exercise of free will or choice among its people, stifling their ability to live in freedom. The Iranian regime is particularly repressive with respect to religious expression. Laws and regulations in Iran are based on an extremist interpretation of Islam and Sharia law. The people of Iran are forced to conform to extremism, not secular law. Iranian law says that any non-Muslim who encourages a Muslim to convert to another religion should be sentenced to death. This effectively makes the free expression of religion punishable by death. Iran, which is responsible for fully half of the world’s executions, unfairly uses the death penalty to punish non-Muslims in other situations as well. If a victim of a crime is a Muslim, but the perpetrator is not, the perpetrator may be sentenced to death. The Iranian regime controls its citizens by preventing them from choosing their religion. Muslims in Iran are prohibited from converting to other religions or from renouncing Islam. Anyone who is born into a Muslim community in Iran must remain a Muslim forever. The right to choose one’s faith is nonexistent. The National Council of Resistance of Iran (NCRI), of which the MEK is the largest member, has long stood in opposition to the regime’s treatment of religious minorities and sought to draw attention to their plight. The NCRI and MEK have also sought to clarify that the regime’s interpretation of the Islamic faith runs counter to the true values of peace and sharing promoted by religion. The idea that anyone would be prohibited from choosing and following their own spiritual path seems bizarre and abhorrent to those living in a free society, but this is a fact of life in Iran. Freedom of religion is absent in a country where women are not permitted to attend sporting events and are forced to abide by a rigid dress code. Freedom does not exist in a country where minorities are persecuted and those who dare to protest against the regime are shot in the streets. The clerical regime who rules Iran uses these restrictions to suppress and control the people and maintain its power. These restrictions fly in the face of basic human rights, but despite the pleas of human rights activists, nothing has changed. 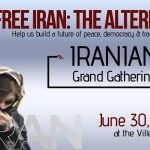 The annual Free Iran rally in Paris on June 30th will provide an opportunity for the NCRI to discuss ways to use the resistance movement to help the Iranian people achieve freedom. 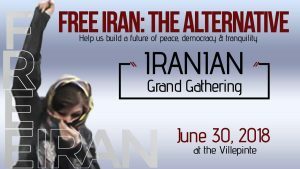 The rally will affirm the support of the NCRI and MEK for the people of Iran in their desire for regime change. In the absence of any capacity for reform in the velayat-e-Faqih(the rule of the divine over an entire nation)’s dictatorship, the people of Iran have made it clear that regime change is the only path forward. The regime has systematically oppressed its people for four decades and shows no signs of stopping. The pattern of corruption, brutality, exportation of terrorism, and suppression is beyond reform. The MEK stands firmly behind the people of Iran in their quest for regime change.